Home > Blog > Ask our experts > 130 year old photo mystery solved in Lismore. Meet the Evans couple. 130 year old photo mystery solved in Lismore. Meet the Evans couple. I’m hoping you can tell me approximately when the photograph (above) may have been taken. The carte measures 95mm x 55mm and appears to have had a very light cream mount. On the back is written, “Believed to be Alfred Thomas Evans and Mary Ann Sarah White (Evans)” and the photographer’s stamp says, “W.S. Read”. I believe it was taken in Lismore, New South Wales, as Read was a photographer there in the 1800s and 1900s. 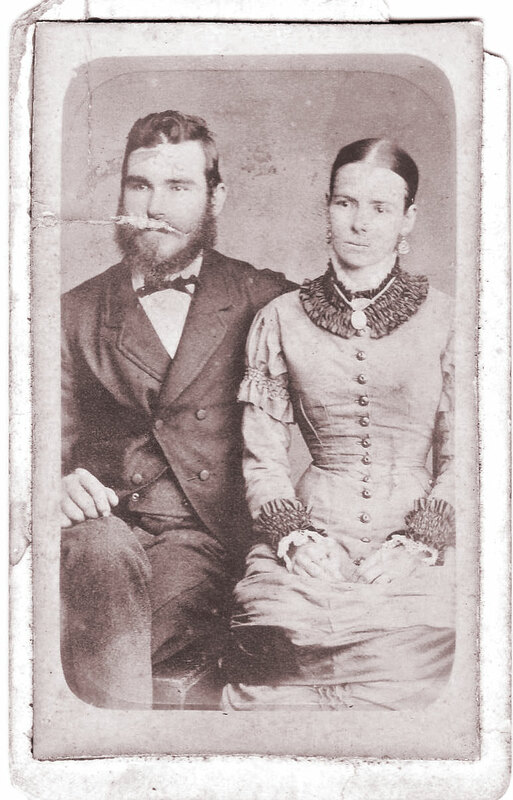 Knowing the date it was taken would help us identify if it is indeed Alfred and Mary Ann, who were married in Lismore in 1883 and are my husband’s grandparents. Alan Davies and Margot Riley say: Yes, William S Read was a photographer in Lismore from 1883 to 1926. However, there is no doubt this carte is dated to the 1880s. We can be fairly certain the couple were photographed in Read’s studio (at that time opposite the Freemasons Hotel in Molesworth Street) between 1883 and 1885. The dress worn by Mrs Evans is a little ‘dated’ for this period, as one might expect in a country area. This image shows the trend for the ‘sheath dress’ introduced in about 1875 with its form-fitting, princess line (no waist seam) and boned bodice that reached below the hips. This slenderising of the body continued its progressively constricting downward descent through the early 1880s eventually restraining movement of the knees as skirts were fitted with inner ties reducing walking to tiny, mincing steps. It’s not surprising this dress lags a bit behind the ‘fashion plate’ ideal for 1883 as that year saw the silhouette shift away from the straightness of the princess line, swinging back to the bustled and draped overskirts of the more picturesque ‘polonaise’ style of the 1870s. It is, therefore, unlikely that this is a new dress and perhaps also indicates this was not a planned visit to the studio but rather more a case of this young couple taking the chance to have their photograph taken while they were in town on other business. The appearance of this carte suggests it was enamelled or at least burnished. A burnisher was a device that dragged the mounted print against heated and highly polished metal rollers to produce a shiny finish. The practice of burnishing prints began in 1873 and remained popular until the turn of the century. Even shinier surfaces were produced by enamelling with coatings of gelatine or collodion. In 1883, Read advertised his burnished cartes for 1/- each and enamelled cartes twice as much. By 1889, he had reduced his enamelled cartes to 10/6 per dozen. Alan Davies is curator of photographs at the State Library of NSW and is a co-author of The Mechanical Eye in Australia: Photography 1841–1900. Margot Riley is based at the State Library of NSW and is a historian with a special interest in textiles and dress.